My boys are masters of collecting clutter. I have tried to limit the number of toys that come into our home, but we have still ended up with many things that my boys no longer use. 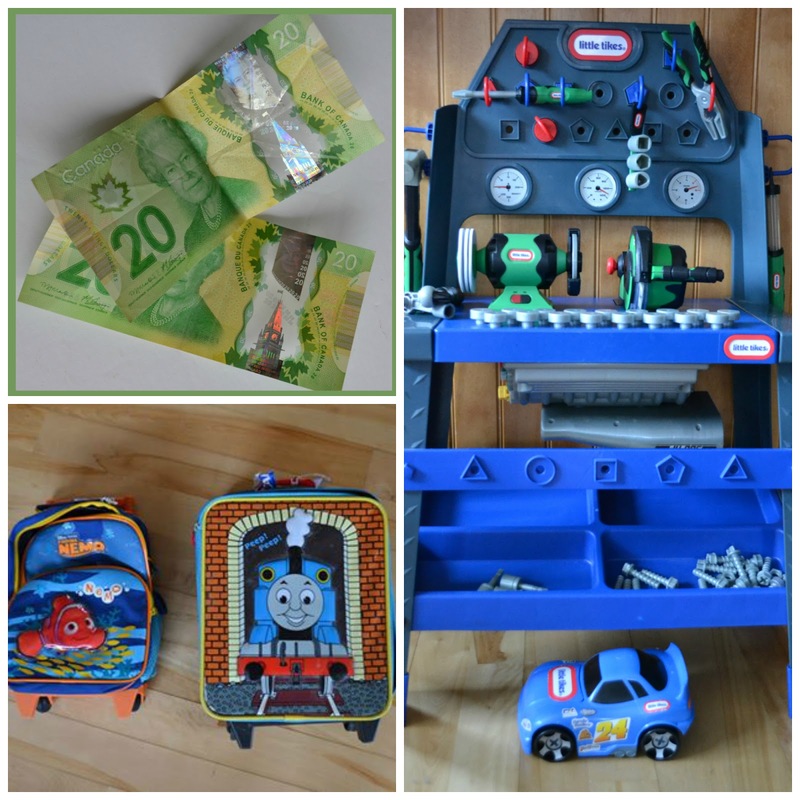 Kids are always reluctant to get rid of toys and gear, but today I am sharing a fantastic way to convince them to de-clutter while teaching them a valuable lesson about saving for something they want. My boys were recently given an old Playstation, and they are currently using the TV in my bedroom to play it. They really want a TV in our basement, but the area is currently full of toys. So, I gave the boys the option of selling some of their things to make room for a TV. I also told them that they can use the money from the sale of the items to fund the purchase of a new or used TV. I made a cute label, and I attached it to a jar. Every time we sell something, I will put the money in the jar. Clever, right? 3) Take a good picture. A picture is worth a thousand words, and the buyers are going to want to see the item. Make sure the item is clean, the lighting is good, the picture is clear, and the image is close up. 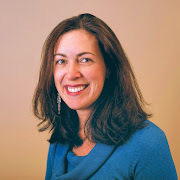 (When creating a quality ad, it's helpful to have a white backdrop and iPad/iPhone holder, but the most important thing is to have a quality digital camera or smart phone). 6) Be creative! Many of the most viewed ads on Kijiji are different than the rest. One way to achieve this is with humour, and another is creative storytelling to pique interest in your item. I love that embracing the second-hand economy allows me to: de-clutter my home, help the environment, make money, and teach valuable lessons to my boys. Do you love buying and selling used items as much as I do? What are your best tips? 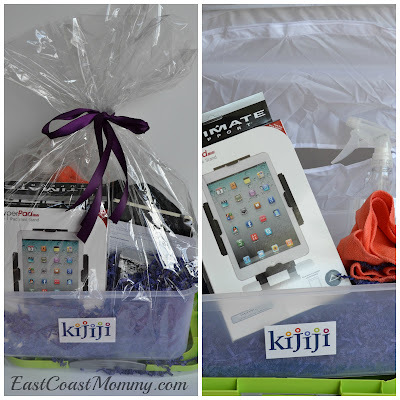 Disclosure – I received compensation from Kijiji for writing this post and for sharing my honest opinion. As always, the opinions on this blog are my own. Celebrating a change in seasons can be a lot of fun, and Spring provides the perfect inspiration for some fantastic crafts. 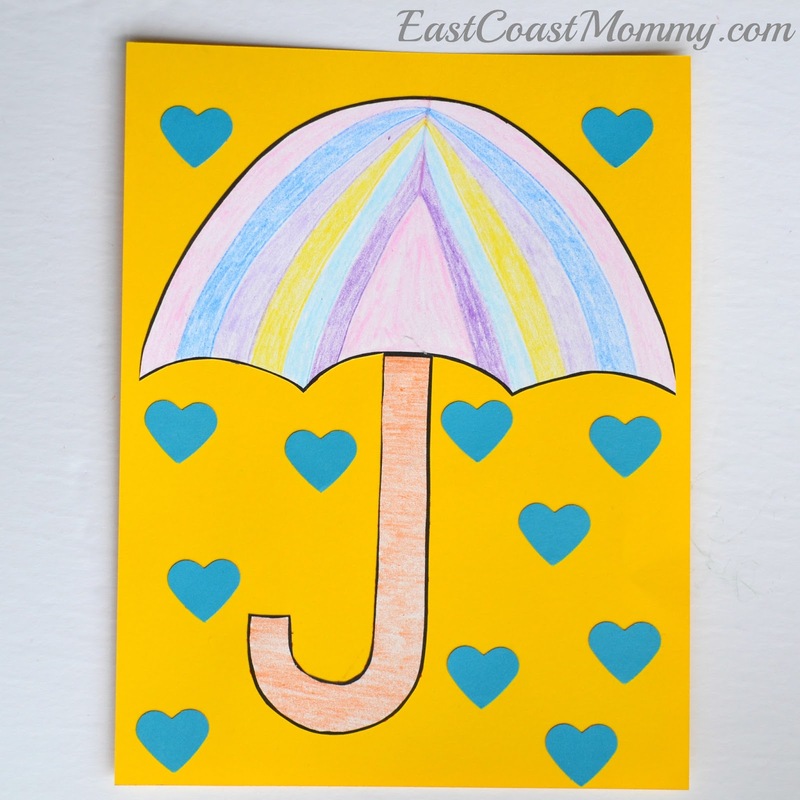 I love the cheerful colors associated with Spring, don't you? 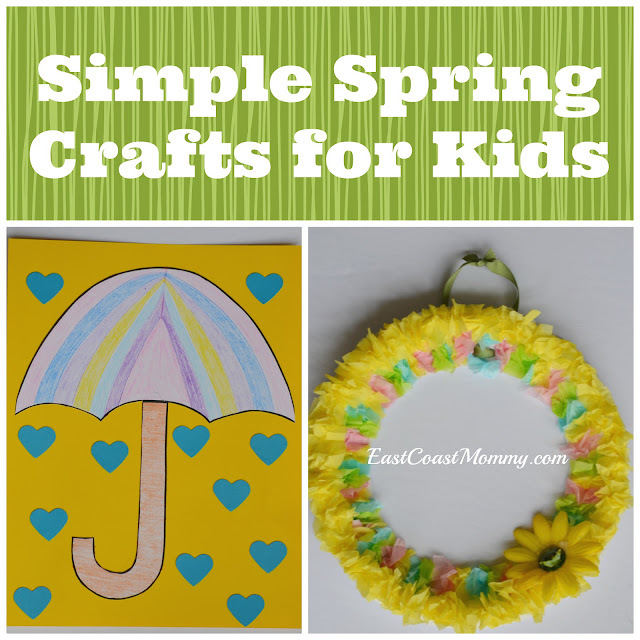 Today, I am sharing two wonderful crafts that are inspired by Spring. To make a delightful Spring wreath, you'll need: a paper plate, tissue paper in lovely Spring colors, glue, ribbon, and a dollar store flower. 1) Cut the centre from a paper plate. 2) Punch a couple holes in the top of the plate, and insert a ribbon for hanging. 3) Scrunch up 1-inch squares of tissue paper, and use glue to cover the entire surface of the paper plate. 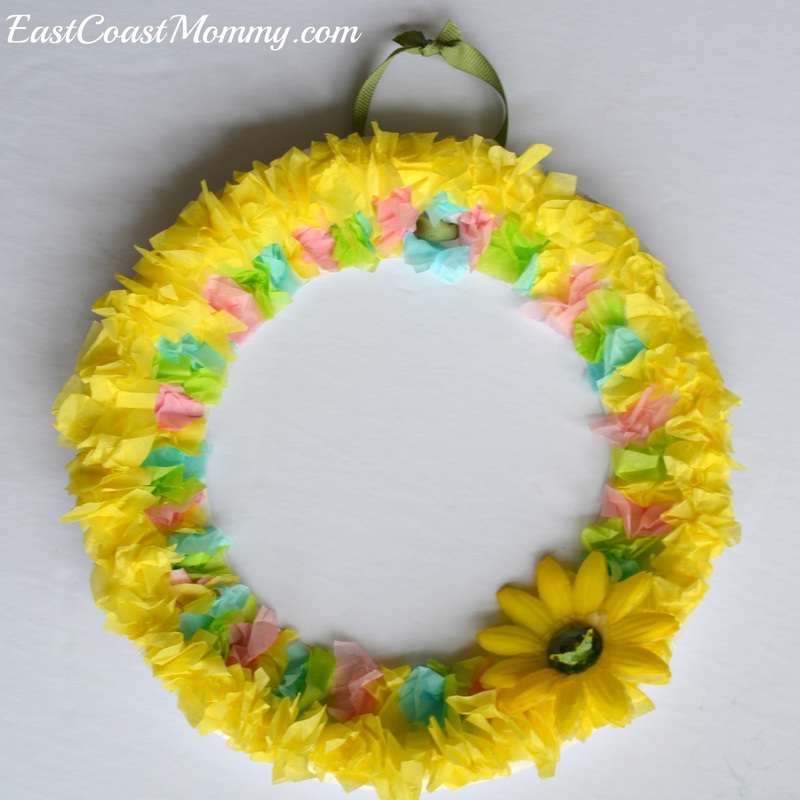 4) Allow the glue to dry, and add a dollar store flower. 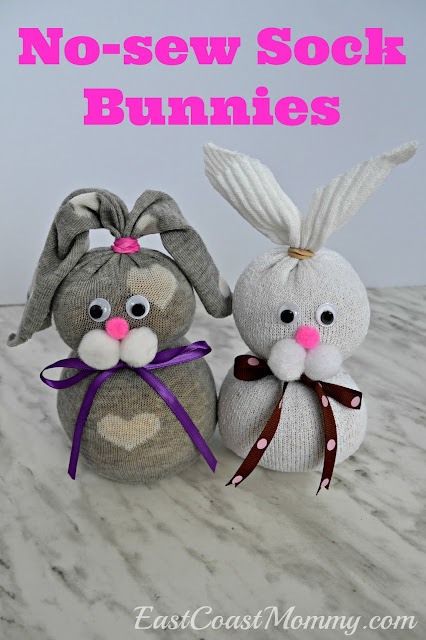 Aren't these adorable Spring crafts? They work well for toddlers and pre-schoolers, but older children will like them too. 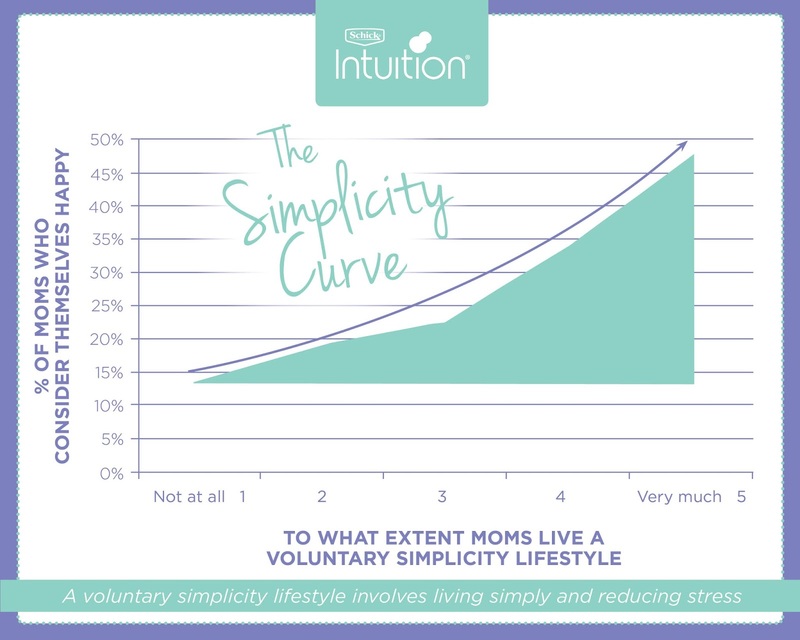 Recently, Schick Intuition surveyed some moms across Canada, and they found that there is a direct correlation between happiness and simplicity. Their research showed that happiness spikes when people take deliberate steps to make life more manageable and embrace a philosophy of voluntary simplicity. I am not surprised by the results, and today I am sharing 5 ways to simplify your life. 1) Make small changes - Small changes are the easiest to make, and they are mostly likely to become part of your lifestyle. e.g. 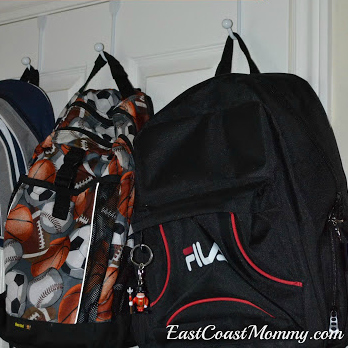 Set up some over-the-door hooks for the kids to hang their backpacks on. It will become habit to hang up their backpacks on the way into the house, and you won't have need to trip over backpacks on the floor. 2) Get organized - Organization can be simple and inexpensive, and being organized will make you feel more in control and less stressed. You can check out my favorite dollar store organization ideas here. 3) De-clutter - We all have too much "stuff", so take some time to get rid of the things you don't use. 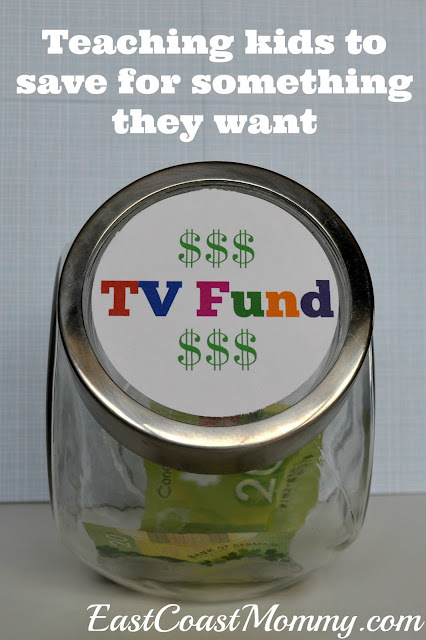 You can even get the kids involved and make a little extra money. Check out my tips for selling kids' gear here. 4) Use a family calendar - If you write all deadlines and activities down (in one place), you'll instantly feel like you have better control over the crazy schedules of all the people in your home. 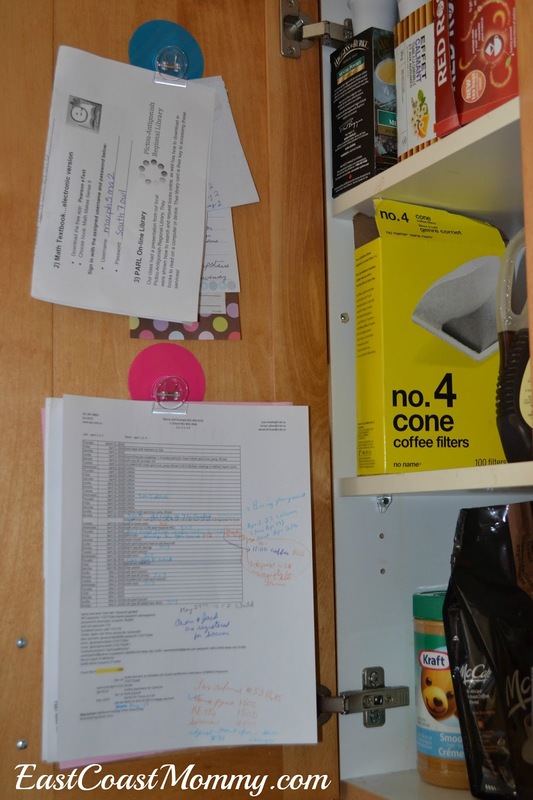 I use a spreadsheet on the inside of my cupboard, and I consult it several times a day. It's a simple idea that really reduces my stress. 5) Look for products that can help - Always be on the lookout for products that can simplify your life. e.g. Pre-cut vegetables can speed up a busy supper time prep, a bag clip can be used on a wrap to make eating easier for a child, or a 3-in-1 razor can help you have a quicker shower in the morning. 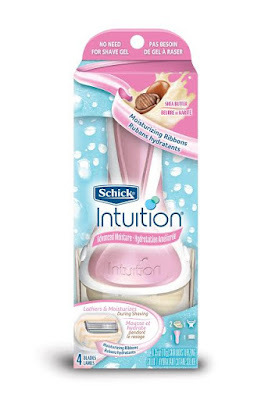 Schick Intuition found that 8 in 10 moms look for these kinds of products and services because even small changes can help contribute to a simpler lifestyle. Simplifying little things in your life can make your overall routine easier and happier. Need more inspiration for simplifying your life? You can find some fantastic and clever ideas on the Schick Intuition Simplicity Curve Pinterest board, and by setting up your own Pinterest board, you will get a chance to win a $100 prize pack from Schick Intuition. I've set up my own board here. 1) Follow @IntuitionCA on Pinterest. 2) Share what simplicity means to you! 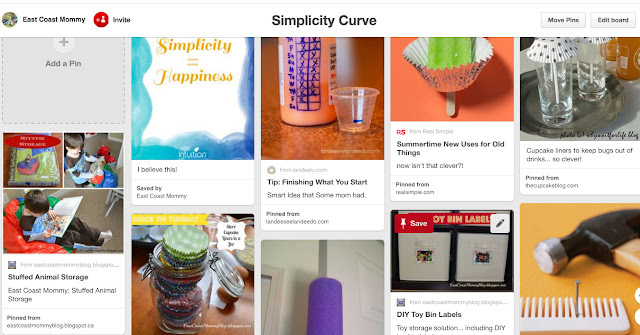 Create a board called “Simplicity Curve” and Pin your ideas using the hashtag #IntuitionSimplicityCurveContest. 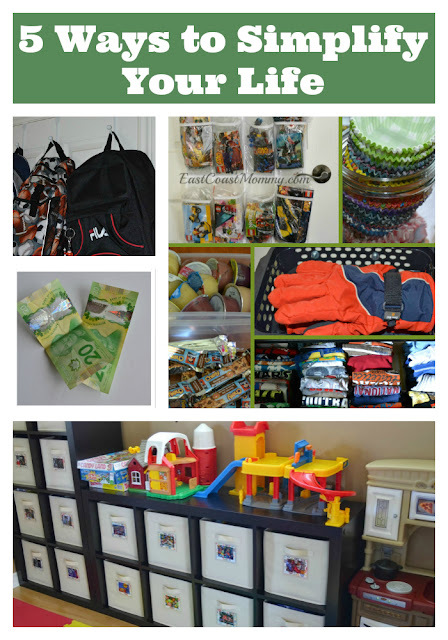 3) For inspiration, visit @IntuitionCA’s Pinterest boards and re-pin if you like what you see. 4) Next, visit www.SimplicityCurve.ca where you can submit up to three URL links of your Simplicity Curve Pins. Submitting is easy; copy the link to your Pinned photo and paste into the submission form. 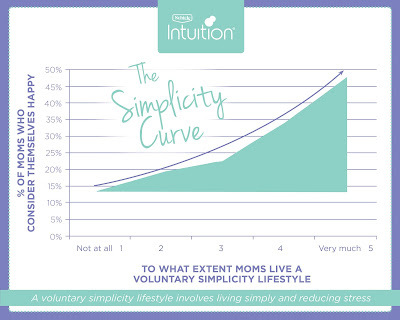 5) Each week, one entrant will win a #IntuitionSimplicityCurveContest prize pack valued at $100! The prize pack includes a $75 gift card and Schick Intuition shave products to help simplify your beauty routine. Happy Pinning! A few weeks ago I shared a cool technique that my boys and I used to create 3D Sharpie artwork. We enjoyed the project so much that I thought we could use a similar process to create Sharpie tinfoil pendants. 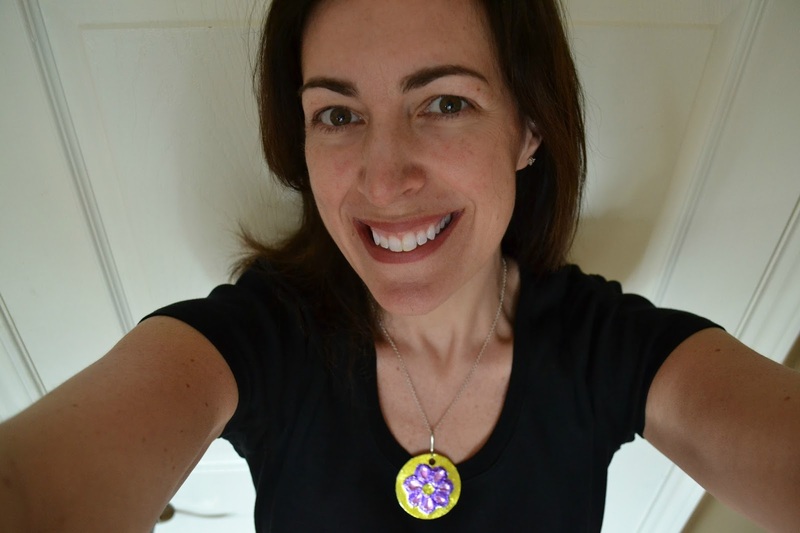 These pendants can be used as necklace charms, keychains or backpack clips. 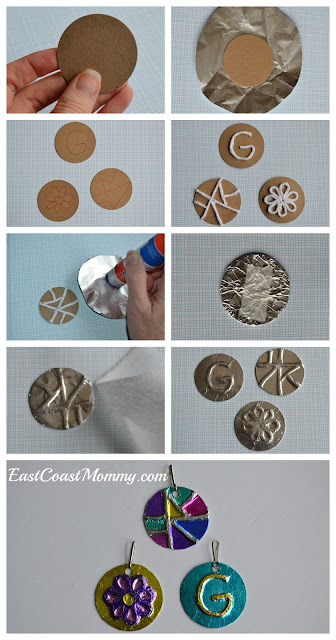 1) Cut a small (1 ½ inch) circle from an old cereal box. 2) Cut a slightly bigger circle from tin foil. 3) Draw a simple design on the cardboard, cover the outline of the design with glue and yarn, and set it aside to dry. 4) Cover the dull side of the tin foil with a glue stick, wrap the tin foil around the cardboard containing the design, and secure the tinfoil with a piece of tape on the backside of the pendant. 5) Rub the tinfoil on the front of the pendant with a piece of felt to help the yarn design show through. 6) Colour the design with Sharpies, and allow to dry. You could use a piece of yarn or ribbon, but I hung mine from a chain I had in my jewellery box. Cute, right? I think this is a fantastic craft for kids of all ages. 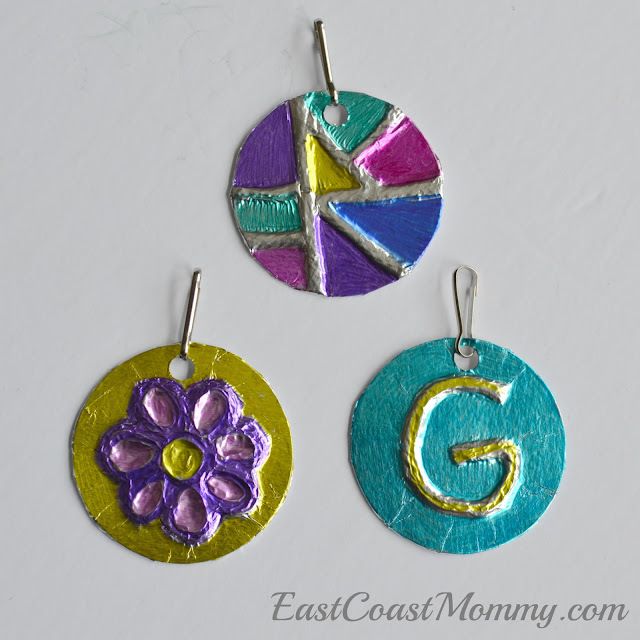 These Sharpie tinfoil pendants would make a fun homemade gift for Mother's Day too! Before I had kids, I had no idea they came with so much "stuff". 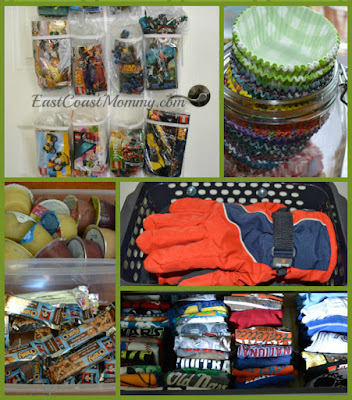 The need to stay organized and the desire to save money have motivated me to get involved in the second-hand economy. 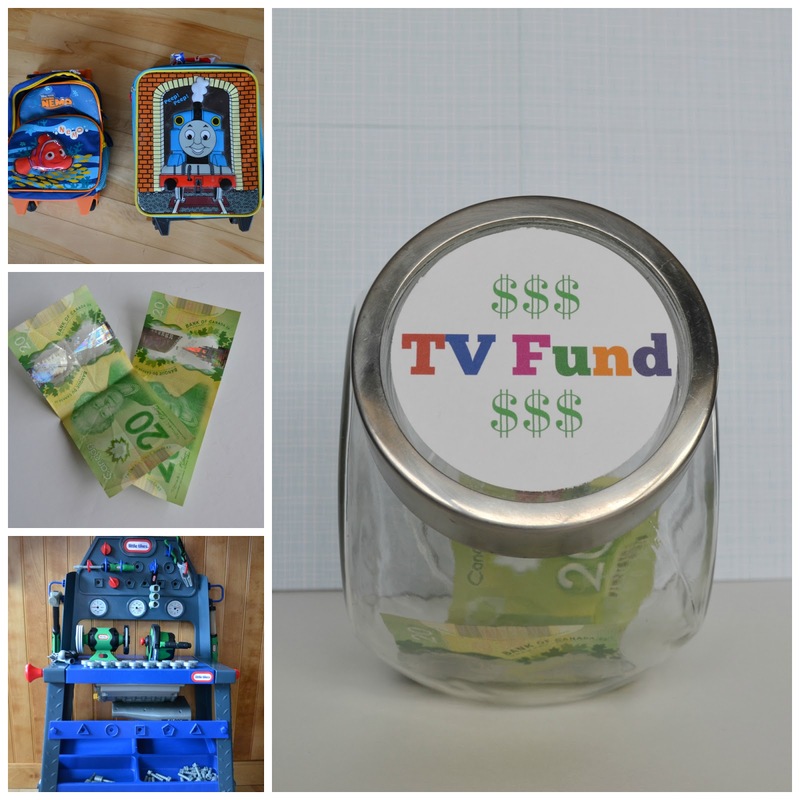 I love to sell the gear, toys, and clothes my boys no longer use, and I love to save money by buying items second-hand. 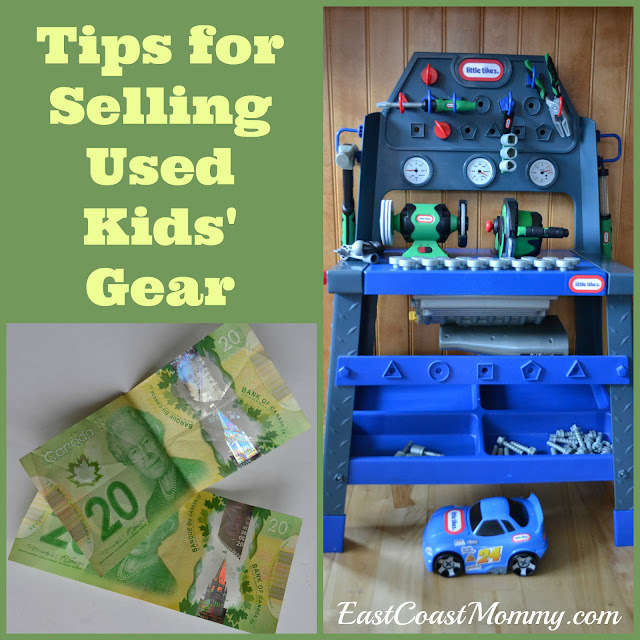 Today, I am sharing 5 tips for successfully selling kids' gear. 1) Let the kids pick the items to sell. There will be less drama, and it will be a learning opportunity for the little ones. 2) Make sure the items are clean and in working order, and take a good picture. Ensure the lighting is good and the features of the product are easily visable. 3) Price the item correctly. Remember that people are looking for a good deal on a used item, so don't overprice it. 4) Use the internet to sell your item. Yesterday, I sold a toy in one day using Kijiji.ca. 5) Let the kids decide what to do with the money for the sold items. They can donate it to charity, save it, or use it to buy something else (whether it is new or second-hand). Letting them have control over the proceeds will encourage them to get rid of stuff. For those of us who are Spring cleaning, now is the perfect time to purge. Getting rid of clothes and gear that kids no longer need is a fantastic way to de-clutter, make some money, and help the environment. Last year, 85% of Canadians participated in the second-hand economy. It’s a win-win for Canadians and the environment. You can learn more about the second-hand economy in Canada, and the role Canadians play in it, check out www.secondhandeconomy.kijiji.ca. How do you get rid of unwanted kids' gear in your home? Disclosure – I received compensation from Kijiji for writing this post and for sharing my honest opinion; however, (as always) the opinions on this blog are my own. As a mom of three boys that are very close in age, I often find it challenging to get a consensus... on anything. Even picking a movie on family movie night can be difficult. Today I am sharing a few simple tips on getting siblings to agree. 2) Take turns - This seems obvious, but it does work. Kids really want to feel that things are "fair", so keep track, and give everyone a chance to have their own way. 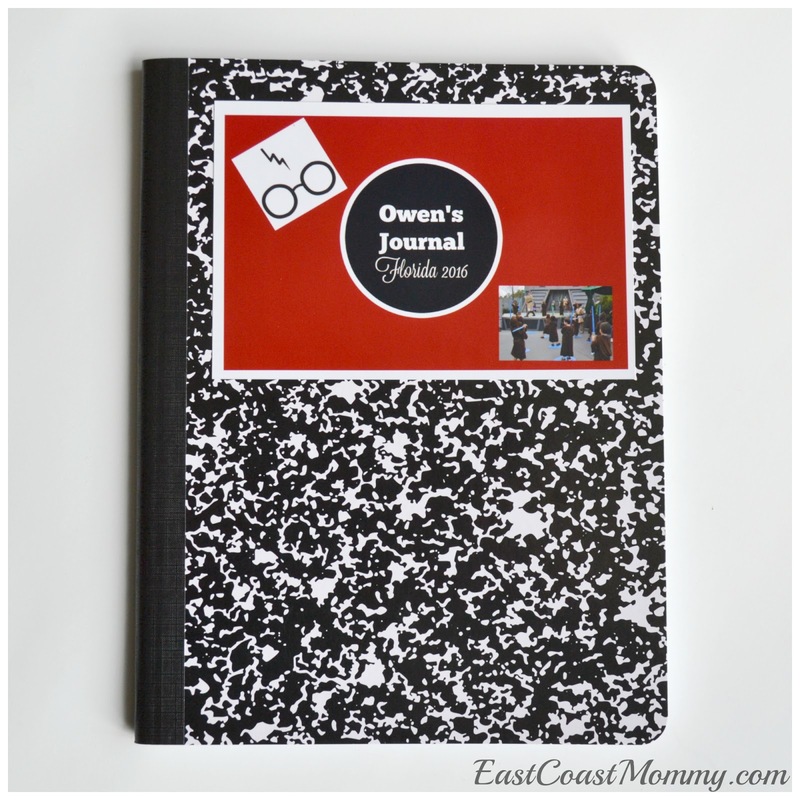 3) Get creative - In the past, my husband and I have had to get creative when trying to get our boys to agree. We have even made decisions based on mathematics! e.g. Everyone's first choice gets a 3 points, everyone's second choice gets 2 points, and everyone's third choice gets 1 point. Then, I add up all the values, and the winner is clear. 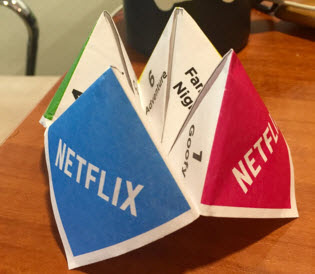 You could also "make it a game" using a fortune teller. 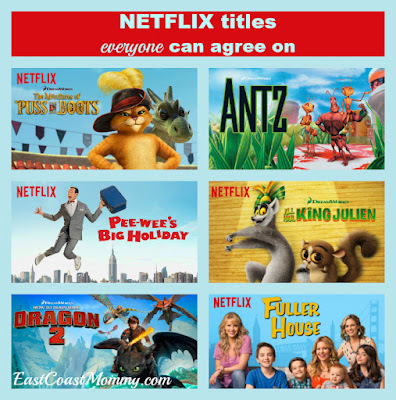 Netflix has one that you can download here. 4) Let everyone win - Sometimes (not always) the best solution is to find a way to let everyone "win". e.g. 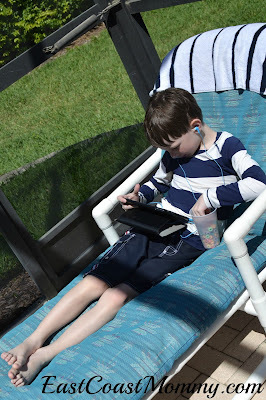 On a recent vacation, my boys couldn't agree on a movie, so they watched Netflix movies on different devices. My boys are buddies, and they get along most of the time, but these tips are really helpful on the occasions when they can't agree. 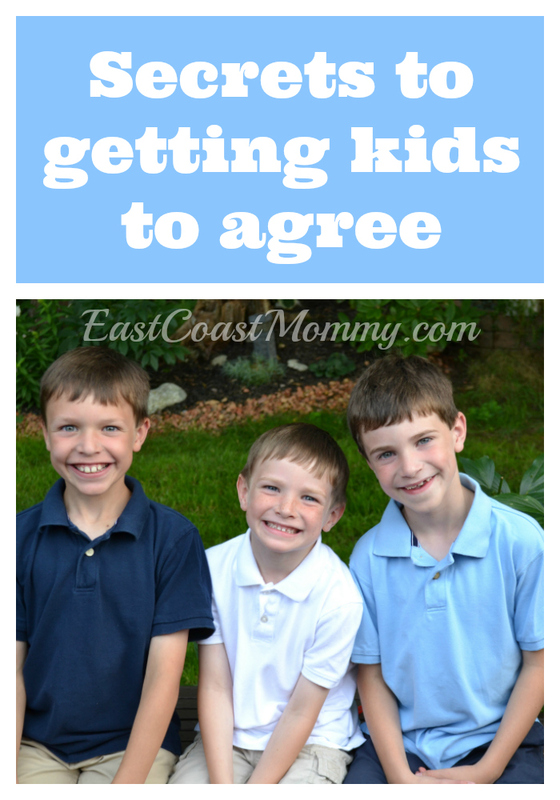 What works for you when you are trying to get your kids to agree on something? Leave your suggestions in the comments below. Thanks! 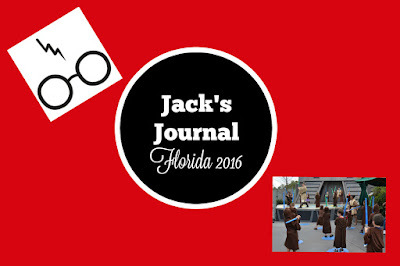 When we travel, I like my boys to fill out travel journals. When they were younger, they just scribbled and drew pictures, but now that they are older, they can actually use their journals to chronicle their adventures. Today, I am sharing the DIY Travel Journals I just made for our recent trip to Florida. 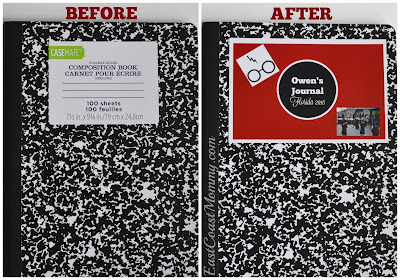 I love that I was able to create CUSTOM Travel Journals for LESS than $2! I started with basic composition books that I purchased for just $1 each. Then, I designed simple 4X6 tags at Picmonkey.com. I printed the tags (like regular 4X6 photos) for only $0.19 each at my local photo processing store. 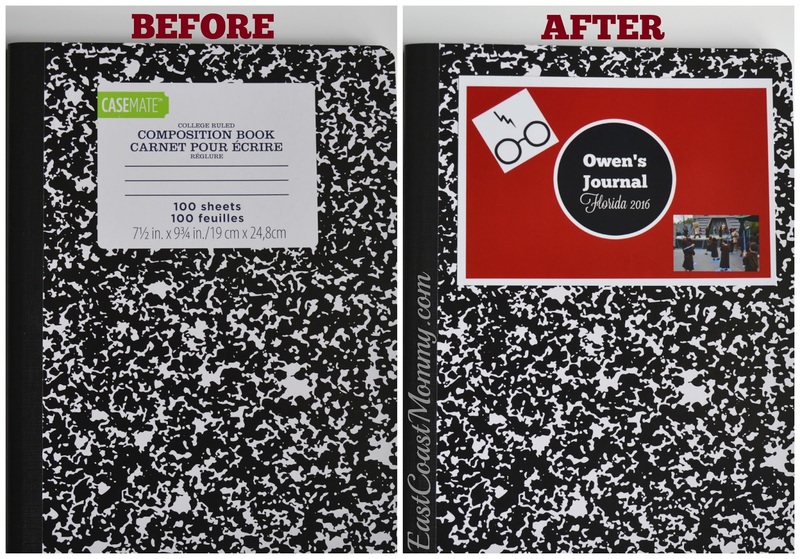 I attached the tags to the journals using double-sided tape. 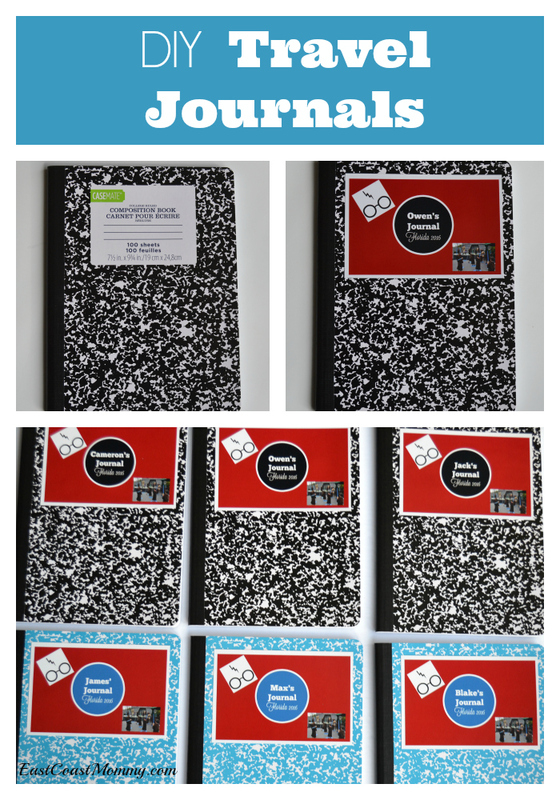 I was easily able to make six journals (for my boys and their cousins) for less than $8. Pretty fantastic, right? 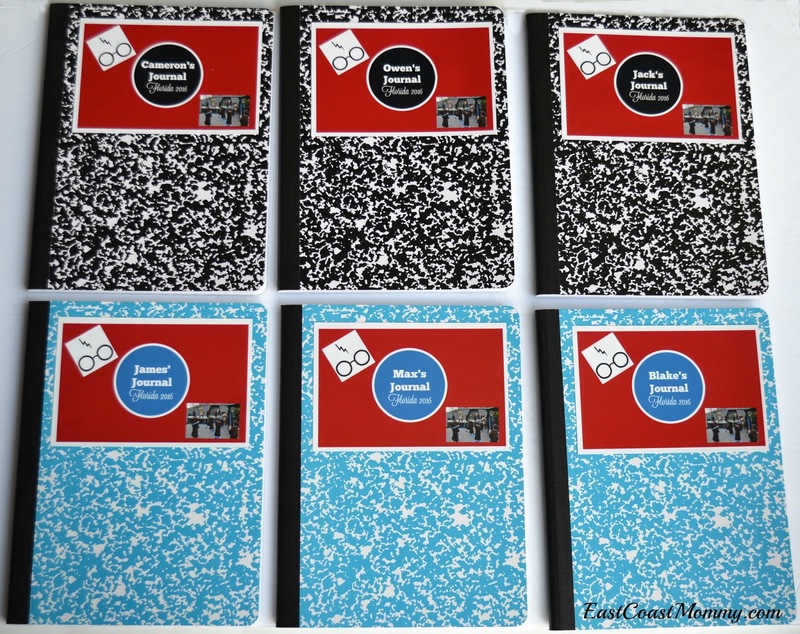 The boys will also use double sided tape to add photos and ticket stubs to their books. 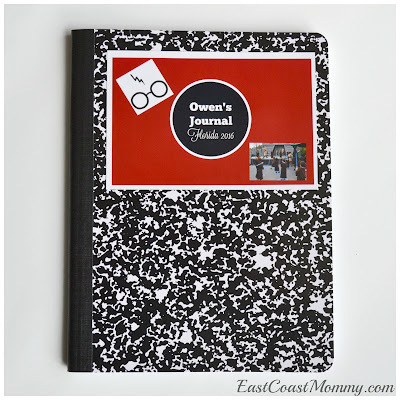 I think these DIY travel journals make a fantastic keepsake, don't you? Feeding and entertaining kids while travelling can be a challenge. 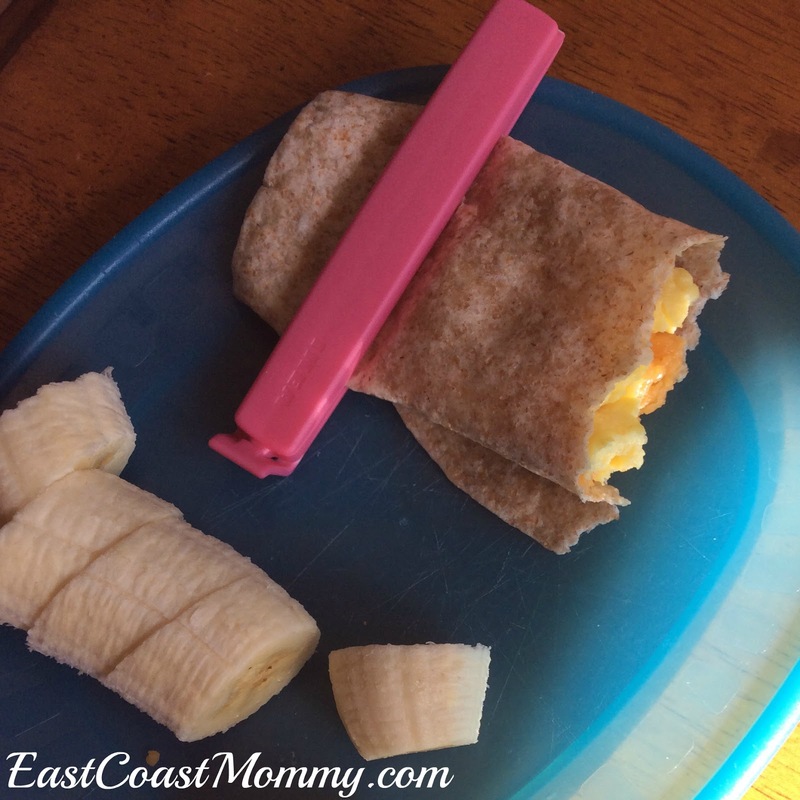 I like packing lunches and snacks to take with us because it is much more economical and convenient than grabbing food "on the go". 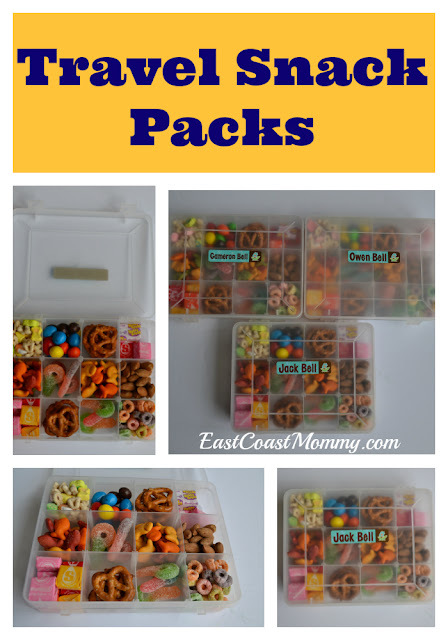 For our upcoming family trip to Florida, I packed some fun travel snack packs for my boys to take in their backpacks. 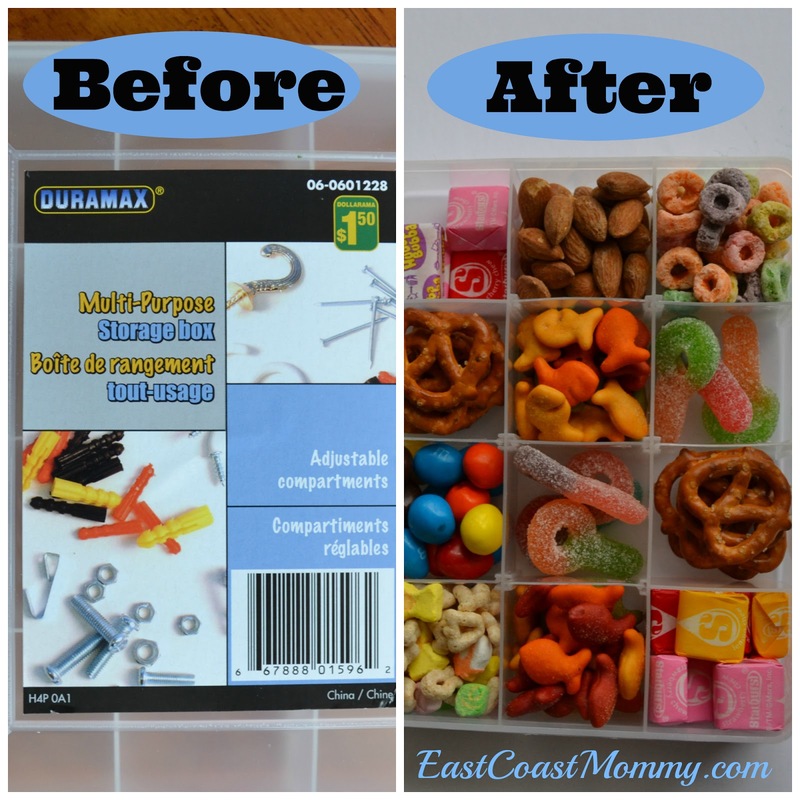 I started with a storage box from the dollar store, and I packed each section with some things that I had in my cupboard and some special "vacation treat" purchases. I included things like: cereal, pretzels, crackers, gum, and sweet treats. 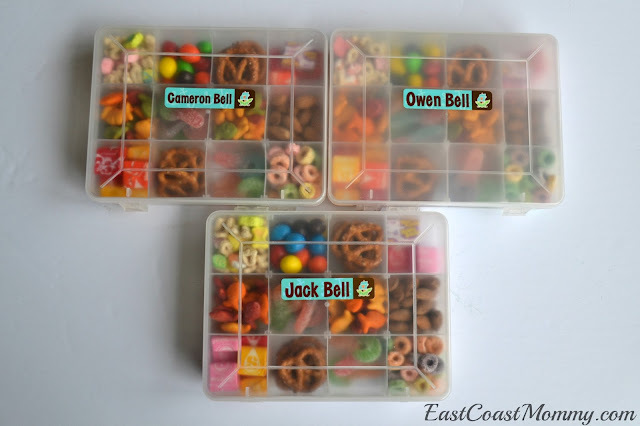 I finished by labelling my boys' travel snack boxes with their names. Cute, right? I think this is a really fun way to pack snacks for a special trip. 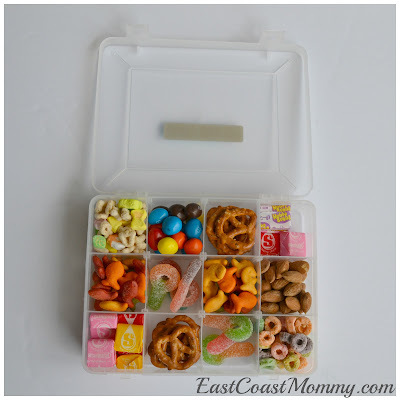 Do you think your kids would enjoy these travel snack boxes?